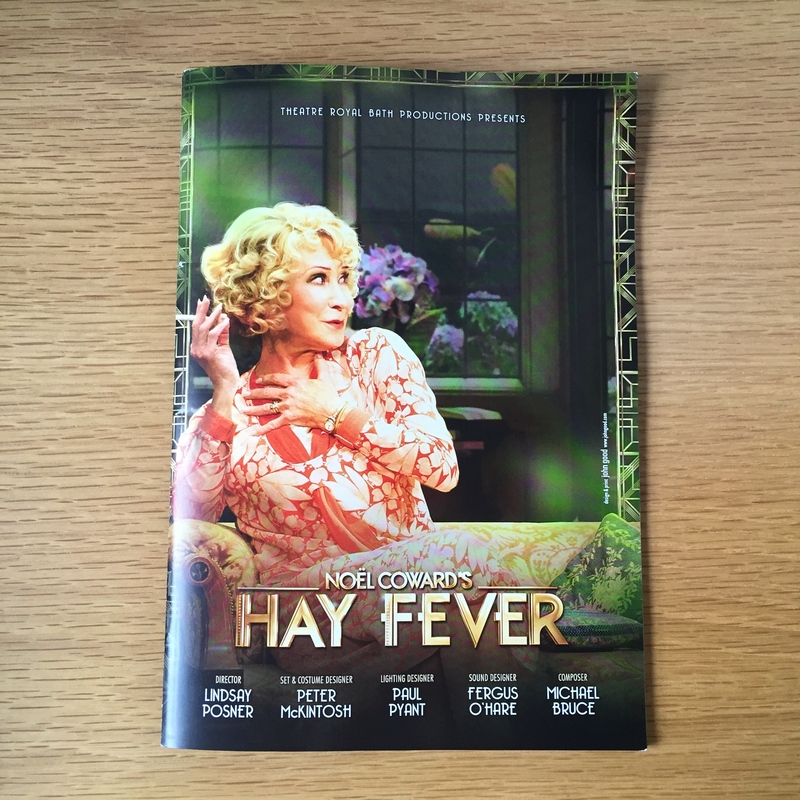 The word ‘sparkling’ must be over-used when it comes to describing Noël Coward’s Hay Fever but it’s perfect for the current production at the Duke of York’s Theatre starring Felicity Kendal. It’s a delight from start to finish, with the whole cast giving impeccable comic performances and expertly delivering The Master’s lines. 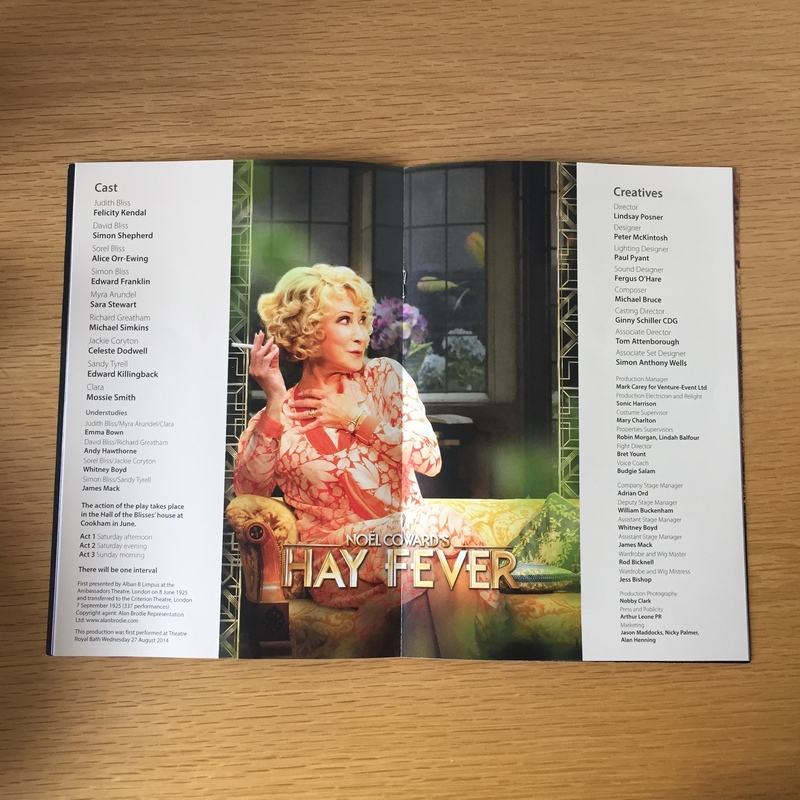 Set in a beautifully bohemian Arts and Crafts house in bucolic Berkshire, the play centres around Kendal’s character, Judith Bliss, a glamorous actress of a certain age. While she may have officially retired from the stage, Judith continues to tackle every moment of domestic life with dramatic gusto. Judith’s artistic, ill-mannered grown-up children (willowy Alice Orr-Ewing and puppyish Edward Franklin) and irascible novelist husband (Simon Shepherd – whom I last saw wearing a nappy in The Duck House, the MPs’ expenses farce at the Vaudeville!) contribute equally to the household’s eccentric atmosphere, displaying disdain for the conventional and the ordinary. Each member of the Bliss family has invited a guest for the weekend. Little do these guests know what they are letting themselves in for… Subverting the ‘nightmare guest’ scenario, Coward presents us with ‘nightmare hosts’ instead and the unwitting visitors are subjected to a range of indignities by the self-absorbed Blisses. From complicated parlour games, to awkward silences, to unexpected seductions in the library (an average evening in the gemmaw700 household by the way…), the Bliss family mercilessly use these guests to satisfy their own need for drama, constantly dissembling, inventing and performing. This makes the Blisses sound unbearable, and with a less accomplished cast and without the assured direction of Lindsay Posner, this may have been the case, but for all their self-absorption, there is something charming about them. Kendal in particular is superb, one moment winsome and delicate, the next husky-voiced and acerbic. But she also invests Judith with an emotional edge, reluctantly aware that her glory days are behind her as she lives vicariously through the imagined romantic intrigues of her children. Richard’s increasingly open-mouthed incredulity as Judith escalates his well-meaning flattery and innocent kiss to imminent marriage collapse and elopement is wonderful to behold and is a great comic performance from Simkins. Sara Stewart is sassy and knowing as the worldly Myra who sees through the affectations of the Bliss family sooner than most. The scenes contrasting Judith’s whimsicalities and Myra’s increasing exasperation are great fun. The Arts and Crafts country house set design by Peter McKintosh (also responsible for the gorgeous 1920s costumes) provides a charming cluttered background of books and artistic ephemera, reflecting the family’s casual bohemianism and emphasising the conventionality of their straight-laced visitors. The final scene sees the exhausted, emotionally spent guests sneaking out of the house, ineptly camouflaged by various hats and luggage, while the eccentric family argue among themselves in rowdy, ignorant ‘bliss’, as self-absorbed as ever. Perfectly staged, perfectly cast and, of course, perfectly written. Thanks Noël!